I’m not dogmatically anti-plastic, but I try to be thoughtful about how and where it is used in my house, and I am trying to cut down. My garden at this time of year grows under a tunnel cloche of plastic. Freezer stuff gets entombed in plastic, because it’s the best at preserving the bulk orders of pastured meats I invest in. My DIY bulk cleaners get transfered to reusable plastic spray bottles. So there’s a compromise there, and I try not to let perfect be the enemy of better when it comes to plastic use. I couple months ago I ran out of plastic wrap, and I just haven’t bought another roll. I love opportunities like this, because I have to start thinking about how to make the kitchen work without plastic wrap. Leftovers aren’t a problem – we have a good sized cache of those glass and reusable rigid plastic containers. The biggest struggle has been keeping my no-knead bread dough from drying out during overnight rises. Plastic wrap stretched over the bowl is perfect for the job, but I needed an alternative. I know of people who use shower caps in place of plastic wrap for things like this, so that’s one option. I haven’t raided the toiletries tray from a hotel in a while, and I’m not eighty, so I don’t just have shower caps lying around. I’d be concerned that shower caps would be made of a non-food safe plastic anyway, but it turns out there are fake shower caps designed specifically to cover food if you like the idea. This company makes a version, and if you follow the link you will be treated to a video of the least competent plastic wrap user in the world. I tried draping a cloth towel on top of the bowl, but that let a dryish crust form on the dough. (Crust on bread = good; crust on dough = bad.) Picking the crusty bits off wasn’t too fun and just kneading them back into the bread didn’t feel right either. I was worried there would be chucks of un-hydrated dough in the finished loaf. I tried aluminum foil, which kept the dough a bit more moist than the towel, but felt pretty wasteful in its own right. Ever since a Facebook follower recommended using crumpled up dirty old foil to scrub pans I feel better about getting a second or third use out of the stuff, but if I don’t need to break it out in the first place, so much better! Which brings me to what did work: a plate. Yup, an old fashioned dinner plate placed on top of the bowl effectively sealed out errant fruit flies who might be attracted to the fermentation, sealed in enough moisture to prevent the dreaded dough crust from forming and didn’t tap into any one-off consumables. After all that, the answer was in the cupboard all along. What plastic are you using in the kitchen, and what alternatives have you found? Plastics aren't a thing of the past in my kitchen, either, but like you, I try to be mindful of them. I still use rigid plastic containers, but I have quit heating food in them. I still use plastic wrap fairly often. I use the plate trick sometimes, too. Some leftovers go into canning jars, but when I'm using them for storage like that, I use the plastic lids instead of metal flats and rings (especially on acidic foods like pasta sauce or salad dressing)…so again, there's plastic. I think getting rid of kitchen plastics is one of the harder changes to make. "I haven't raided the toiletries tray from a hotel in a while, and I'm not eighty, so I don't just have shower caps lying around." I have been doing a lot of research recently on the causes for the "Spike" in the number of "Auto-Immune" diseases and their contributing factors. Not one of the diseases we fear today (including cancer) were as predominant fifty years ago as they are today. One of the main reasons for this is, the technology we employed to make life easier and more efficient for ourselves. It has been proven beyond a doubt by medical research that the "Plastics" that we all embraced without hesitation and all of the subsequent byproducts, have poisoned us slowly but surely to the point where we can now expect to have a 1 in 8 chance of developing some form of "Auto-Immune" disease in our lifetime! There is a way to counteract this forty+ year cycle of toxic abuse but, for some it is obviously too late! Removing anything plastic from use in a microwave oven or the refrigerator freezer will have almost immediate results for improving liver function. We have leached petroleum byproduct chemicals into our systems this way in minute quantities for almost a half century or more now! The liver is unable to process these chemicals, so it just stores them in the adipose tissue around our stomachs and thighs. This where the phenomenon of "Obesity" is getting a grip on the industrialized nations of the world. I was reading another blog and she mentioned that you can get the reusable bowl covers at Dollar Tree, think I will run on over to have a look. My rule of thumb is never to use plastic when heating food or beverages. I use waxed paper a lot as a replacement. And I still use plastic for freezer storage — not sure how to get around that one effectively. I regularly do overnight rises and I find a steel pot lid works well. I sometimes use plates too; but I think the lid is better because if it's a bit smaller than the bowl it can slide down and reduce the air space over the dough. You can't do that with a plate because it would be hard to get it out again without the handle. 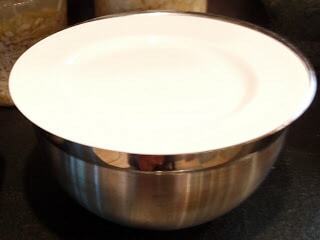 We are fighting the plastic wars here — I have been using plates, saucers and inverted bowls for years, but sometimes find them replaced by wrap — "Your plate was tippy and it was in my way" — so I have been collecting glass saucepan lids from thrift stores. I prefer the ones with the metal handles. Fifty cents apiece, and you can always find the one that fits the bowl you're using. I refrigerate our dough overnight in this arrangement, and shape and bake in the morning, with very good results. These lids are good for all leftovers, and the effect on rice is very pleasing — much less likely to get me in trouble than plates, and so I'm not in as much trouble now. I've always used a plate to cover bread dough and try as often as possible not to use plastic. On occasion I will purchase pre-made or pre-cut food, usually when I'm in a hurry or my husband just HAS to have something that I won't eat or make, and I will re-use the container to start seedlings for the garden. You have to wet the towel so it's damp, and you won't get the dry crusty action. But, I'll generally use a plate unless the bowl is enormous. Oh, the never-ending plastic battle. Each month brings us closer to the "no-plastic touches my food" goal. Plastic can be a wonderful thing that has worked miracles for modern living, but knowing what we know I can't believe more companies aren't helping us find alternatives to it, especially when it comes to food. This is an aside from letting plastic touch our food. My question is why do we believe we need to use brand new plastic garbage bags to contain our garbage? Most garbage cans can be cleaned and are made from materials that don't need a plastic liner. Is there a movement out there to ban plastic garbage bags- it seems like the practical step after banning plastic grocery bags. @ loralea…what a thought! I had never given that a thought before, duh! I guess it seems "cleaner"! Funny, clean garbage. But I am a clean freak, so I guess it's fitting. I also like the glass lid idea from old pots and pans. Smart with a handle, to boot! I've always done the "plate-as-cover" thing, and have never been a fan of plastic wrap (somehow I've never learned how to "operate" it properly!). The huge plastic use around our place are those zip-lock freezer bags for the blueberries (we have a blueberry farm). I'd love to hear of any workable alternatives! I also tend to throw garden produce into plastic bags for 'fridge storage. I Love the pot lid idea. Even better than the plate. Oh, how I hate plastic sandwich bags, but I am unfortunately tied to them because of my boyfriend's inability to not lose every piece of tupperware I send with him to work. I do have a roll of press and seal, right now it's mostly being used to wrap up pie crusts before they go in the fridge, but I think I need to move to a container instead. I prefer glass or crockery containers but I'm not always the most gentle person in the kitchen. Thrifting some old glass containers for storage may be a good idea, so I don't have to worry about wiping out the "good stuff". I let my dough rise in a large rubbermaid container and put its lid lightly on top (not sealed shut). But when I need to cover something with plastic, I put the entire container inside a plastic bag (I have a small collection I wash and reuse), or if won’t fit, flatten a bag and lay it over the top of the bowl. I still find that the little plastic hats are really helpful for the final rise (done in the loaf pan) and also for after they come out of the oven – I brush the tops of my loaves with butter, and then cover them with the little hats, which gets me a good crust that is also reasonably easy to cut through. +1 to the wet towel. I make 3-4 double batches of no-knead bread a week. Always a damp towel (soaked from the tap in lukewarm water, wrung out). Never had an issue with the dough drying out.